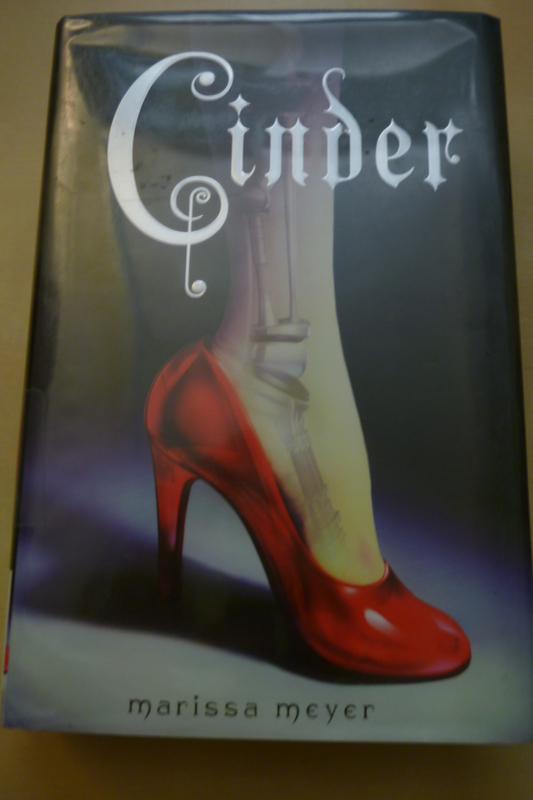 I put Cinder by Marissa Meyer on hold at the library at the beginning of the Once Upon a Time Challenge–in mid-March. It’s only fair to say that my library usually runs through hold lists pretty quickly…but in this case, the book finally got to me in mid-June. I managed to read it about five days before the OUaT Challenge ended! So was it worth the wait? Yes–because I was very curious about it. As you may have guessed or known, Cinder is a retelling of Cinderella, though I was surprised by how loose a retelling it actually was. Set a vague distance into the future, Cinder is a cyborg, mostly human but with a mechanical hand and leg, and circuitry in her brain. While she is downtrodden by her (adoptive, not step) family, and there is a prince and a ball, the book mostly focuses on the search for a cure for a pandemic sweeping the globe, as well as rising tension with Lunars, the human moon-dwellers who have developed mental powers to manipulate others. I quite liked Cinder. She’s a strong Cinderella who’s plotting escape from her family and doesn’t actually care that much about the ball–she has bigger problems to think about. I loved the cyborg-ness too, and wanted more of that element. What was there was fun, from the low-tech (storing things in a compartment in her calf) to the high-tech (she can mentally connect to the internet, and her body warns her when she’s overheating). Prince Kai was a nice guy, though a bit bland. He served his role in the story perfectly well, and had a little more complexity in his uncertainties about how to fulfill his position as prince (and soon to be emperor), but he didn’t strike me all that much either. In a bit of a reversal of that, my one biggest issue with the book was that I wasn’t sure why he was so struck by Cinder. He starts singling her out almost as soon as he meets her–and I do appreciate that they meet and start developing a relationship well before the ball. It’s just that I’m not sure what prompted him to pursue that relationship. I mean, I like Cinder–but I’m really not sure why the prince, who has every girl in the country to pick from, decided he liked this particular one. I’m all in favor of the idea that he saw something special in her, only I don’t feel like the book ever made clear what exactly it was, or even if there was something–I’m just assuming there must have been. So it wasn’t a heart-stopping romance, at least not for me, but I am curious to see where it goes. This book is the beginning of a series, and there are a lot of threads still to be explored. There are some good tensions in Cinder and Kai’s relationship, like the political marriage he’s being manuevered into with the Lunar Queen, and the small fact that Cinder is trying to hide being a cyborg from him. Cyborgs are looked down on as somehow less than human, in what I’m sure is intended to be a reimagining of the social structure of Cinderella’s original setting. I would be remiss if I didn’t also mention Iko. She (it?) is Cinder’s friend and somewhat fairy godmother-like figure, and she’s a robot. She’s a robot who is also a hopeless romantic, quite forward, and often funny. She wants Cinder to go to the ball more than Cinder does, and she’s really rather adorable at times. The most moving moment in the book for me involved Iko’s personality chip–and that’s all I’m going to say, to avoid any spoilers! So, to sum–fascinating concept, good characters (especially Cinder and Iko), okay romance, pretty good plot though at times it stretched on a bit, and one late-in-the-book twist was really obvious (maybe that was just me–but I don’t think so). I liked the book–I didn’t love it–but I am adding it to my list of series, and plan to read the next one when it comes out! I saw this on a LOT of blogs before it finally got to me…did I miss yours? It sounds like an intriguing concept to set the Cinderella story in the future. Seems like a series could explore all aspects of the tale in depth. It definitely does do some unexpected things with the story! I was pleasantly surprised by this book and can’t wait for the rest of the series. It’s not often that an author can have such a good balance of fantasy & sci-fi, especially in a fairy tale retelling. Thanks for linking to my review! For all they’re linked together, it’s true that I rarely see sci fi and fantasy balanced in one book. Enchantress from the Stars is another one that does well with that. I loved IKO too! I really enjoyed this one! Iko was such a good character, providing a lot of humor but also some strong emotional moments.